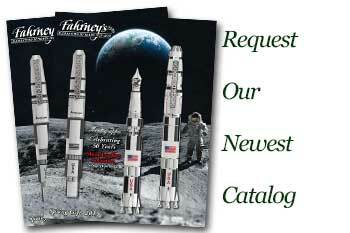 Order your Fahrneys Exclusive Retro 51 Dynasty Blue Dragon Fountain Pen today from FahrneysPens.com. Fine Pens, Refills & Luxurious Gifts – great prices & fast shipping. Fahrney’s is thrilled to present its latest exclusive fountain pen – it matches the recent ‘Dynasty’ Tornado Popper by Retro 51! According to historians, blue and white earthenware originated as early as the 7th century (Tang Dynasty) and became widely popular in the 13th century (Yuan Dynasty). By the 14th century it was mass produced and traded throughout the Eastern world and continues to be popular to this day. Fahrney’s Exclusive Dynasty fountain pen with stainless steel nib is printed with a dragon and a phoenix surrounded by a floral motif inspired by ancient artifacts. The pen is finished with stonewashed pewter accents; the Chinese symbol representing “fortune” is printed on the cap medallion. Each fountain pen is numbered on the top ring and packaged in a commemorative tube with only 300 pieces produced. Make sure to get one for your collection before they become history themselves! Cartridge/converter fill. I love all retros! Including this fun fountain pen design! I love all my retro fountain pens in broad or italic. Not a fine person! Just quality made and nice balance. Other than that perfect for me and fun! Beautiful Pen. Very well made. The blue dragons on white background give it a very Asian ethnic feel. Broad nib just glides on the page without an scratching or feedback. I absolutely love this pen. Totally worth all the money.